Dreaming of a profitable and a high-productive website for your cleaning supplies store? Meet this fully responsive CleanJinn! Designed by top industry leaders, this janitorial theme contains everything you need for a powerful cleaning online store! Various trendy banners will help you to present all the offers and product categories in the best light, while multiple shopping and sorting options together with an enhanced navigation, drop-down cart, and a live search will help your clients to get desired items in a matter of few clicks. 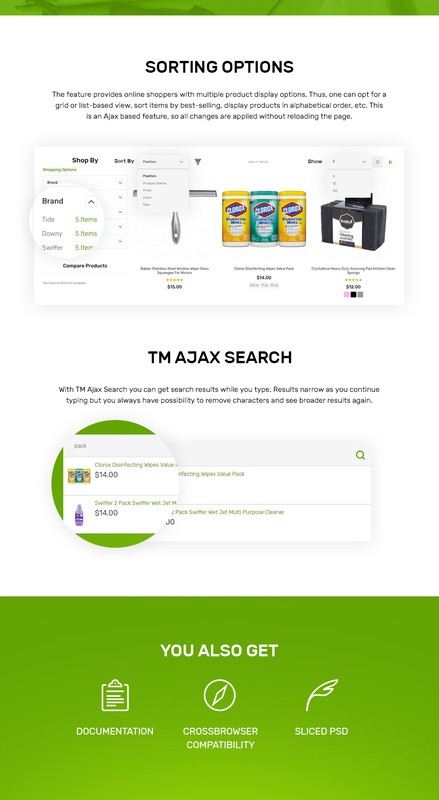 A must-have Wishlist & Compare plugin will help your customers to lay aside favorable cleaning tools and to compare them up to their needs, while a user registration option allows them to create an account on your website to make shopping far more simple and enjoyable. 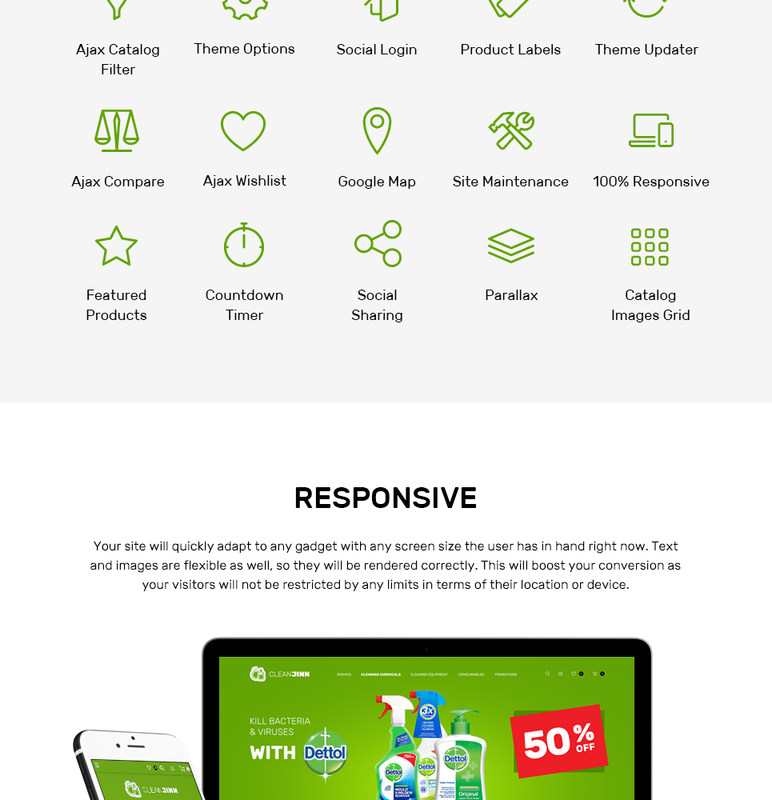 Promote your store all over the web with this house cleaning theme! With the increasing popularity of mobile phones, how many users who log on to the internet sites from cell phones has increased a lot. Such a feature helps you to change websites to mobile devices and different screen extensions, eventually offering cellphone consumers with enhanced opportunities. Search engine friendly design templates are optimized as per the present day SEO standards. This grows the opportunities they will be viewed online, thus rising your domain's ranking positions in search listings. The Search Engine Friendly layout is without a doubt a superb general platform to get started on marketing and advertising and also improving search rates of the internet page. It is usually more convenient to make use of such a internet page for Web optimization specialist merely because half the work is already accomplished. 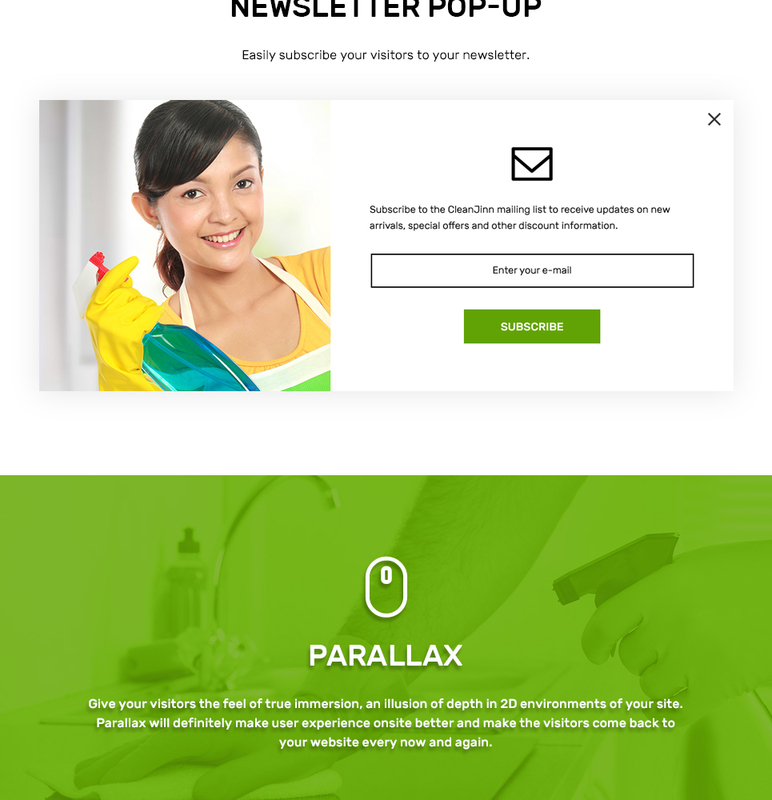 Is there any return policy for Magento templates for Cleaning Agency? Requests for a refund are accepted at www.template-help.com/tickets within the period of 2 weeks after the order of Magento ecommerce template for Household Cleaning is placed. You should accompany this request with detailed and grounded reasons why you apply for a refund. Please make sure your request does not contradict the terms and conditions specified in the policy. A refund is issued to you upon receipt of a Waiver of Copyright signed by you. Make sure that these charges for Magento template for Business & Services have different order IDs. If it is so, contact our billing department. What am I allowed and not allowed to do with the Magento themes for Maintenance Company? You may: Build a website using the Magento template for Business & Services in any way you like.You may not:Resell or redistribute templates (like we do).Claim intellectual or exclusive ownership to any of our products, modified or unmodified. All products are property of content providing companies and individuals.Make more than one project using the same template (you have to purchase the same template once more in order to make another project with the same design). Can I use graphics from Cleaning Company Magento design theme I purchased for use in printing? Yes, it's not prohibited to use the Cleaning Company Magento design theme graphics for printed material, but the resolution of the templates graphics ( except for logo templates) is not enough for printing. In what cases I don't need the extended license for Maid Services Magento ecommerce templates? Can I resell Cleaning Goods Magento templates I bought the developers license for? You cannot resell the customized Offices Cleaning Magento ecommerce template as a template, but you may sell it as a project to your client. Can I put a line at the bottom ( or any other spot) of the customized Magento ecommerce theme for Maintenance Hotels Services "Website design by Company name"? No, you cannot place a line at the bottom ( or any other spot) of the customized Magento ecommerce theme for Maintenance Hotels Services saying "Website design by Company name". Nevertheless, you can place "Customized by Company name". What is Extended License for Magento design for Maintenance Support Services ? Can I resell the Cleaning Company Magento designs I bought the extended license for? No, you cannot resell the Cleaning Company Magento designs as is. You can only sell them as the integral part of your new product. Can I get the extended license for some other pricing than the half of the initial Magento ecommerce template for Household Cleaning price? No. 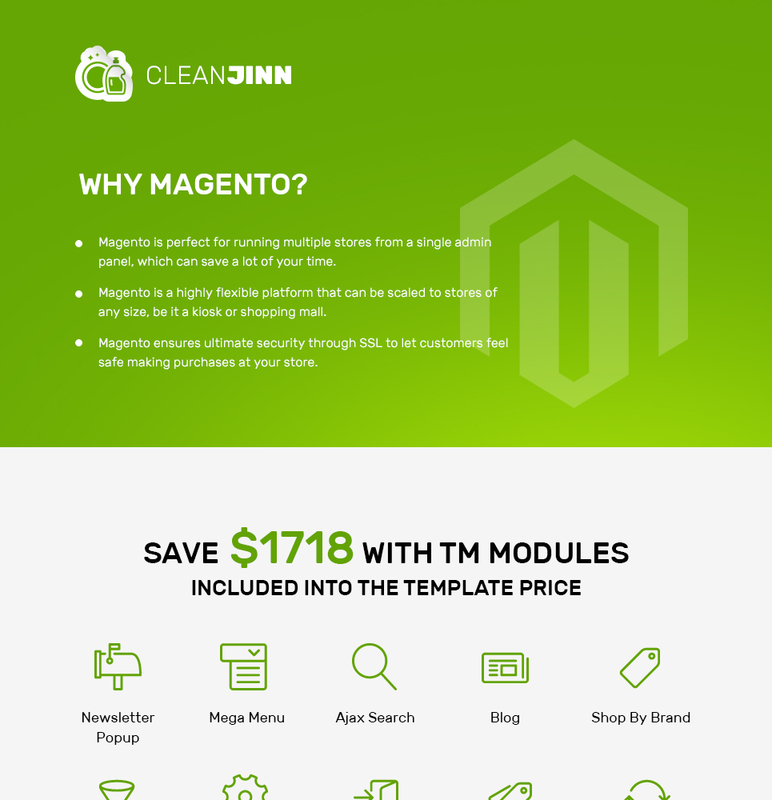 The price for purchasing license for a single Magento ecommerce template for Household Cleaning is the half of the template unique price. What will I see instead of the images after installation of the Maid Services Magento ecommerce theme? After Maid Services Magento ecommerce theme installation you will see blurred images included for demo purposes only. I ordered a Magento template for Cleaning Company but haven't received the download information. In case of not receiving the download information of a Magento template for Cleaning Company, please contact our Billing Department via support chat by phone or e-mail. What is the difference between unique and non-unique Magento ecommerce template for Maintenance Service Supplies purchase? Non-unique purchase:Non-exclusive purchase means that other people can buy the Magento ecommerce template for Maintenance Service Supplies you have chosen some time later. Unique purchase:Exclusive purchase guarantees that you are the last person to buy this template. After an exclusive purchase occurs the template is being permanently removed from the sales directory and will never be available to other customers again. Only you and people who bought the template before you will own it. Can I resell the customized Magento ecommerce template for Business News ? No, you cannot resell the customized Magento ecommerce template for Business News as a template but you may sell it as a project to your client (see paragraph 1 ONE TIME USAGE LICENSE for more details). 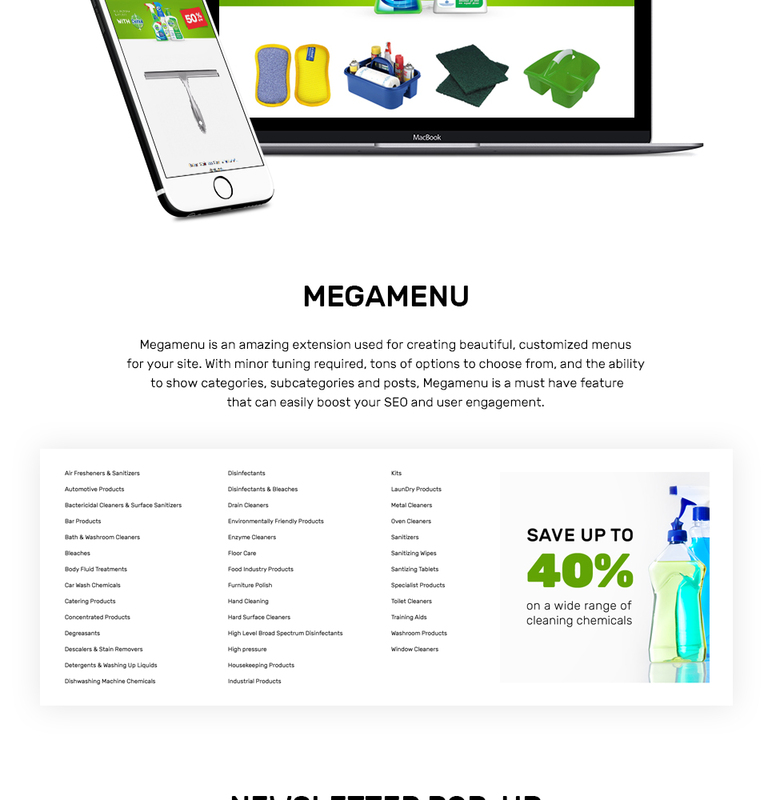 Can I put a line at the bottom (or any other spot) of my new product "Website development by Company name" after purchasing Home Cleaning Magento theme? Yes, you can place a note at the bottom (or any other spot) of my product "Website development by Company name". Nevertheless, you cannot place "Website design by Company name" while using one of Home Cleaning Magento theme. What is a buyout purchase license for Magento design theme for Cleaning Agency? If you purchase the product at a 'Buyout price' it guarantees that you are the last person to buy this template from us. It means that this Magento design theme for Cleaning Agency may have been sold before a couple of times (see 'Downloads' number in item's properties) but only you and people who bought the template before you will own it. After this kind of purchase the template is being permanently removed from our sales directory and is never available to other customers again. The buyout purchase license allows you to develop the unlimited number of projects based on this template, but the template should be customized differently for every project. Can I contact the Business Bureau Magento template author? Yes. You can contact this Business Bureau Magento template author/author's team directly using your personal account under the Support tab. Will you help me to customize my Facility Company Magento theme? We do not provide any help or instructions on Facility Company Magento theme customization except for www.template-help.com help center. If you are not sure you can customize the template yourself we recommend to hire a design studio to customize the template for you. Are there any discounts if I'm buying over 10, 20, 30 or more Magento template for Maintenance Services Company ? Please email to marketing@templatemonster.com with your inquiries about Magento ecommerce templates for Cleaning Goods. Can I customize the Magento design for Maintenance Company if that's required by application settings? Yes, you can customize the Magento design for Maintenance Company code, graphics, fonts to any extent needed. Is it possible to reactivate my download link for Maintenance Facility Services Magento theme if it was deactivated after 3 days? Yes. Please re-activate the download link for Maintenance Facility Services Magento theme within your account under the Downloads tab or contact our billing department directly regarding that. What is a one time usage license for a Business Bureau Magento template? When you buy the Business Bureau Magento template at usual price you automatically get the one time usage license. It enables you to use each individual product on a single website only, belonging to either you or your client. You have to purchase the same template again if you plan to use the same design in connection with another or other projects. When passing files to your client please delete the template files from your computer.